- High spring constant range. The DNISP-HS is a hand crafted ultra high force cantilever for nanoindenting/nanoscratching applications. 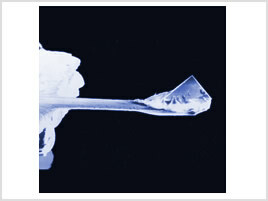 The tip is designed to be ultra high strength and is fabricated by precision grinding of a solid diamond. These tips are not for use in general imaging. The diamond tip apex is the corner of a cube so that three right angle planes form the apex “A”. 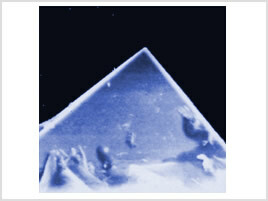 To provide more symmetric dents, the diamond is mounted with the vertical axis of the tip approximately normal to the sample when mounted on the microscope. The nanoindenting probe is designed for use in air and is not recommended for liquid operation due to contamination & solvent incompatibility issues.